It’s a brand new month… and you know what that means at Magic Kingdom’s Casey’s Corner? 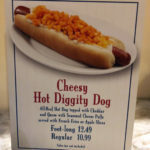 It means it’s time for the announcement of the featured Hot Diggity Dog of the Month! For February, the Buffalo Chicken Hot Dog returns as the Hot Diggity Dog of the Month, topped with Buffalo chicken, diced celery, and a drizzle of garlic ranch sauce. Specialty Hot Dogs at Casey’s come in Foot Long ($13.49, with fries) or regular ($11.49, with fries). 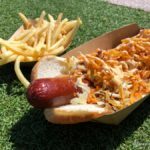 And remember, you can also order up those same toppings on the Loaded Fries ($6.49), which take the toppings from the Hot Diggity Dog and piles them on top of French Fries! Happy February from Casey’s Corner! 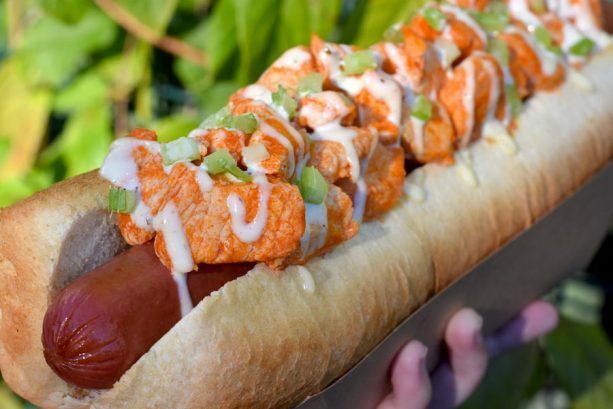 Would you like to try the Buffalo Chicken Hot Dog? Please let us know with a comment! Review: Is Casey’s Corner Buffalo Chicken Hot Diggity Dog of the Month a Home Run? Review! 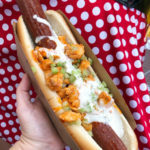 We Tried the “Cheetos” Hot Dog in Magic Kingdom! 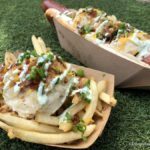 Review: Loaded Mashed Potato Hot Dog in Magic Kingdom! Plus Potato-Topped… Potatoes?!? 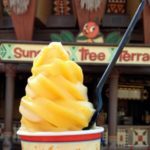 « When Will Tangaroa Terrace Reopen at Disneyland Hotel?